Defending champion Paula Radcliffe stormed to victory in the New York Marathon ahead of Ludmila Petrova and Kara Goucher of the United States. She became the second woman to win the race three times, but unlike her 2004 and 2007 wins this was by a big margin. Radcliffe finished in two hours, 23 minutes, 56 seconds, nearly two minutes ahead of the 40-year-old Petrova. 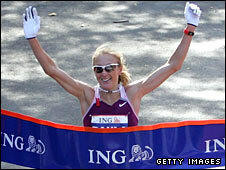 The Russian became the oldest woman to finish in the top two since Britain's Priscilla Welch, 42, won in 1987. Goucher, making her marathon debut, become the first American on the podium since Anne Marie Letko was third in 1994. Petrova, who won the race in 2000, clocked a time of 2:25:43, just ahead of Goucher (2:25:53). Radcliffe's success came after a year marred by injury which prevented her from preparing properly for the Beijing Olympics. In 2004, her victory over Susan Chepkemei in a close finish came nine weeks after her failure to finish the Olympic marathon in Athens. And last year's equally hard-fought win over Gete Wami marked her return to racing following the birth of her first child Isla 10 months earlier. "It was tough out there because of the wind - everybody wanted to run behind me," said the 34-year-old after her latest triumph. "This year I was determined to feel comfortable at the halfway point. The last two times it's been a really close finish, so it was nice to make it a little easier on my husband (Gary Lough). "I definitely think I could have run a course record on a calm day but the conditions are what they are on the day and you can't go guessing what times might have been. "The most important thing for me was to come here and win the race but I do believe women should be able to run under 2:20 on this course. We definitely threw a minute away in the first mile." Radcliffe has only ever run 10 marathons, winning eight of them. Her only failures have come in the last two Olympics. She added: "It does make it frustrating because you think, 'Why can I get it right all the time in New York and I can't get it right there?' But sometimes you have to take what life gives you." Britain's Hayley Haining finished 12th in 2:35:11, just under four seconds ahead of compatriot Lucy Macalister (2:39:25). Brazil's Marilson Gomes dos Santos won the men's race, with Abderrahim Goumri of Morocco second, followed by Kenyan Daniel Rono. Dos Santos fell off Goumri's pace in the 20th mile but surged ahead in Central Park to win in an unofficial time of 2:06:43, with Goumri runner-up for the second year in a row in 2:07:08.